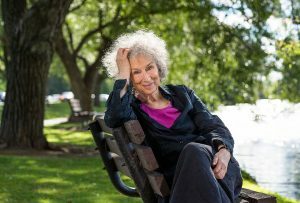 While the world spent the week weeping over once-in-500-year floods, possible apocalypses, and the latest barbarisms of Donald Trump (in short it was a typical Book-of-Revelations end-of-August 7-Days-That-Were kind of week), Canada remained focused on author Margaret Atwood’s backyard. Margaret Atwood, among the trees. According to the nation’s journal of record, Toronto Life, “Margaret Atwood is really mad about some condos being built near her house.” Apparently Alterra Developments is planning to build an eight-story, 16 unit condo mid-rise (what are known in RealEstate-speak as “luxury boutique condos”) on Davenport Road, on the northern edge of a quaint Toronto downtown neighbourhood known as the Annex, uncomfortably close to where the author of The Handmaid’s Tale (which has enjoyed a major TV revival this year) and her spouse, writer Graeme Gibson, live in a little fix-er-upper Frog Hollow-type shack (which is now worth several million dollars due to international market forces and through no fault of Ms. Atwood’s own, except for her failure to join a major Marxist-Leninist political movement that would overthrow evil capitalism in the Western World). Rather than causing the Revolution, La Atwood settled for sending a “strongly worded letter” to the city objecting to the development proposal on the grounds that it would disrupt the neighbourhood and kill a few trees. By the way, when we note Toronto Life’s elevation to the nation’s journal-of-record, we are not entirely kidding. This week, while the nation focused its mind on Atwood’s backyard, the previous journal-of-record, the Globe and Mail, announced it was trimming down various stand-alone sections of the paper and reducing its “freelancers’ footprint” by firing columnists Tabatha Southey and Leah McLaren (but leaving in place the chief plagiarising Handmaid columnist Margaret Wente). Ah, cry us a river of obsolete ink. Her tormenters were legion. (The amount of anti-Atwood envy extant in the land is one of the under-reported stories of the year.) The most callous of them declared, “It’s sad [that] Margaret Atwood can write about inequality and oppression so well but can’t realize when she’s part of it.” Atwood demurely pointed out that she’d been living in the district for three decades. But the Twitter pile-on was unrelenting as she was repeatedly charged with being a wealthy fat cat, out of touch, and, worst of all, and again and again, old. The TL piece detaiing all these local doings was written in the new style of a string of Tweets, punctuated by a word here and there. But why not? As one wag on Facebook pointed out, if there can be articles consisting of lists of things (known as “listicles” of course), why couldn‘t there be articles consisting of strings of tweets (known as “tweeticles” presumably). In addition to such tweets, the article also records the statistics, the number of “replies” and “retweets.” At one point in this exchange, believe it or not, there were 4040 replies and 1313 retweets. One gets the picture of an utterly bored national populace literally twiddling its thumbs on a smartphone while patiently waiting for the famous snow of the Great White North True and Strong, or Whatever. Atwood replied: “Tell you what. Trade you. You get to be old + decrepit with accumulated $ put by over a lifetime, I get to be young and yell at you. Deal?